Most parts of the north India on Tuesday experienced a chilly day as mercury dropped further by a few notches amid foggy conditions, with the national capital recording its lowest temperature this season. Mercury remained one to three degree celsius below normal in Punjab, Haryana and Chandigarh as cold wave swept across the region. Adampur in Punjab recorded a low of zero degree celsius, while Amritsar settled at 3.6 degrees, meteorological office said. Rohtak was the coldest place in Haryana with a minimum of 3.5 degree celsius while Karnal recorded a low of 5 degrees -- both places three degrees below normal. Union territory Chandigarh recorded a low of 6.2 degrees. 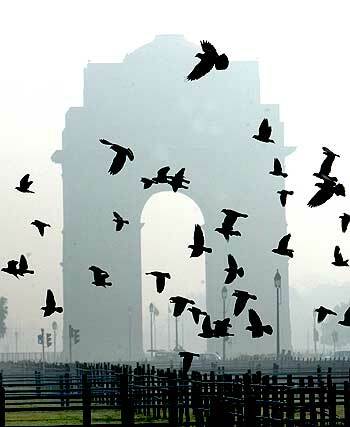 In the national capital New Delhi, mercury plummeted to the season's lowest of 6.4 degree, which was two notches below normal, even as fog engulfed the city skyline in the morning. 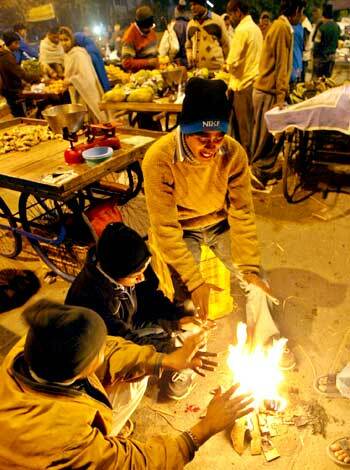 On Monday, the minimum temperature in Delhi was 7.4 degrees. The snowfall in upper reaches of Himachal and Kashmir has brought down the temperature, a met official said. Higher reaches of Himachal Pradesh witnessed harsh cold conditions with the temperature dipping to sub-zero levels at several places. Keylong, headquarters of Lahaul and Spiti district, was the coldest place in the hill state where night temperature was recorded at minus 8.3 degree celsius. Under the impact of cold winds, temperatures dropped in Shimla and other lower areas. 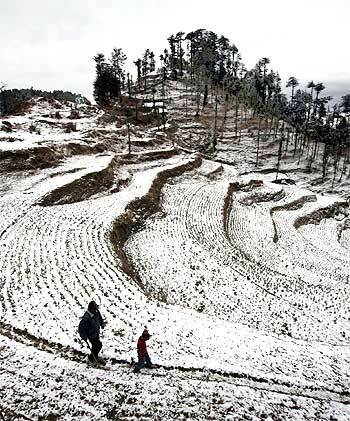 The state capital recorded a night temperature of 4.4 degrees, while the day temperature was 14.6 deg C.
In Rajasthan, Churu remained the coldest place with a minimum temperature of 4.7 degrees, followed by Mount Abu which settled at 6 degree celsius. Gangangar and Jaipur recorded a minimum of 6.2 and 8.8 degree celsius respectively, met office said. Most parts in Jammu and Kashmir were reeling under sub-zero night temperatures, even as mercury showed a slight upward trend during the day. Kargil recorded a low of minus 15 degrees and a high of minus 3 degree celsius, while Leh recorded a minimum of minus 10 degrees and a maximum temperature of minus 0.4 degree celsius. 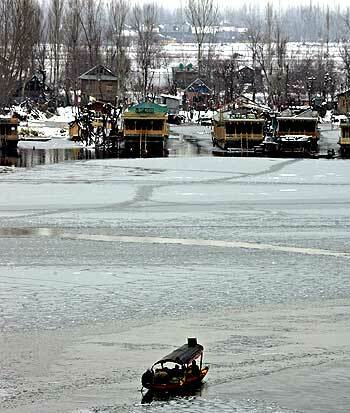 In Kashmir Valley, Srinagar recorded a low of minus 2.6 degrees celsius, while hill resort Pahalgam settled at minus 6.2. Meanwhile, Jammu recorded a night temperature of 4.7 degrees.